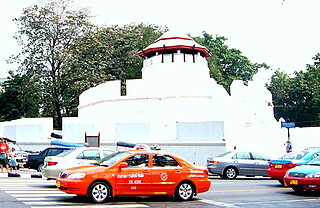 Fort Mahakarn is situated on the banks of Rob Krung Canal, the second canal ring, along Maha Chai Road. 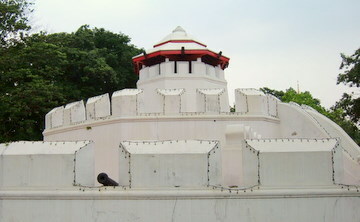 The fort is part of the rings of forts defending the eastern wall of old Rattanakosin. Built during the reign of King Rama I, Fort Mahakarn is similar in design to its counterpart, Fort Phra Sumen two concentric rings of battlements with cannon; an observation tower in the center. The other similarity is the small park between the fort and the canal. The similarities end there. There are two different aspects to this fort. Firstly, the remaining old city wall is still intact. 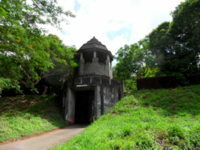 The old wall runs from the fort for about 200 m along Maha Chai Road; the old gateway is still there. The second aspect is that there is an old community that is still living within the 40 m strip of land between the wall and the canal! Beyond a dividing wall in the small park and stretching for the next 200 m, is the old Fort Mahakarn community. The tenure of this community has been a legal dispute running for 14 years between the city administration and the community. The Bangkok Metropolitan Authority (BMA) intends to resettle the residents who are encroaching on canal banks, clear the congested slums and convert the area into a public park. The residents, with the backing of civic groups, insist on staying put, as they have been there for generations, almost a century. 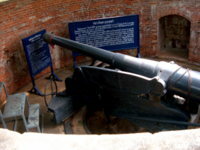 The civic groups argue that the presence of a community adds life and historical significance to this fort, without which the monument will be a lifeless relic. In 2004, the BMA put on hold the eviction orders and proposed to lease the disputed land under a 30-year lease. The BMA proposed building a cluster of new houses for the residents on one-third of the land and developing the remaining area into a bigger park. The residents on their part undertook to maintain the park and provide a conducive and safe environment for tourists. If this social experiment works, Fort Mahakarn may well turn out to be a living Bangkok legacy. In March 2005, the Supreme Court upheld the right of the BMA to evict the residents, though the Bangkok Governor was still receptive to the land sharing compromise. However in August 2005, the Bangkok Metropolitan Authority reversed their decision and renewed attempts to evict the 287 residents. Their houses will be levelled to make way for an open park. On 29 November 2005, the long impasse between the Bangkok Metropolitan Authorities and the Fort Mahakarn community finally ended. 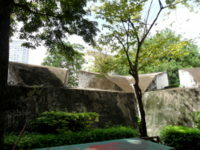 The city authorities started demolishing the first few houses in the community around the old fort in line with the city plan to develop a public park in the area. The dream of turning the historical site into a living museum may not be a reality after all. On 7 December, the BMA reversed their decision and stopped the demolition. A new plan was proposed to develop the area into a village of vintage houses. Like the residents, we wait with bated breath for the next turn of events. 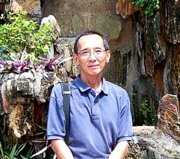 Thankfully on 31 July 2006 the Bangkok Metropolitan Authority announced plans to commission a research team from the Silpakorn University of Fine Arts to create four museums on the grounds of the old community. The 47 families comprising 287 persons will be allowed to stay on and look after the museum and park. With so many proposals and reversals concerning the future of this old community, we can only hope that this proposal will really stick and be implemented. Take the air-conditioned bus service number 79 from Pratunam (bus stop in front of the Grand Diamond Pratunam Hotel). The bus will take you to Ratchadamnoen Avenue past the Fort Mahakarn. The park is open all day. Admission is free. 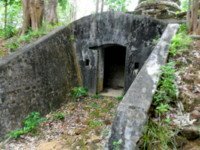 To return to Bangkok Forts.